Though the competition is stiff, the gold medal for the creepiest Washington Post columnist could go to Charles Lane, who this week mocked Sen. Bernie Sanders and his wife for buying a $575,000 vacation home on Vermont's Lake Champlain -- and cited this modest luxury as proof that capitalism is superior to socialism. "To go with places they already own in Washington and their home town of Burlington, Vt., the Sanders family has purchased a vacation home on an island in Lake Champlain," Lane wrote, adding: "As a slogan for the political revolution, 'from each according to his ability, to each according to his need for lakefront property' doesn't really cut it." Ha-ha! Very funny! Sanders's wife Jane explained that the house was a replacement for a vacation home that her family had long owned in Maine. But the 74-year-old Sanders and his wife really need no defense for buying a rather modestly priced (certainly by Washington's standards) lakefront property. Lane's column was also a cheap shot because a U.S. senator has little choice but to have domiciles in both Washington and his home state. So, to cite those two properties as further evidence of Sanders's living a life of hypocritical extravagance is simply unfair. 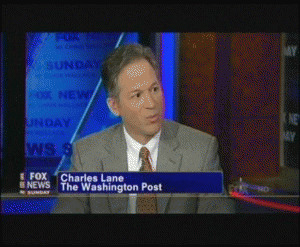 I first got to know Lane in 1987 when we both worked at Newsweek. Before Lane arrived at the magazine, Newsweek had distinguished itself with some quality reporting that belied the Reagan administration's propaganda themes in Central America. That, however, upset Newsweek's executive editor Maynard Parker, who was a strong supporter of U.S. interventionism and sympathized with President Ronald Reagan's aggressive policies in Central America. So, a shake-up was ordered of Newsweek's Central America staff. To give Parker the more supportive coverage he wanted, Lane was brought onboard and dispatched to replace experienced reporters in Central America. Lane soon began getting Newsweek's field coverage in line with Reagan's propaganda themes. But I kept messing up the desired harmony by contesting those stories from Washington. This dynamic was unusual since it's more typical for reporters in the field to challenge the U.S. government's propaganda while journalists tied to the insular world of Washington tend to be seduced by access and to endorse the official line. We had lunch at Scholl's cafeteria near Newsweek's Washington office on Pennsylvania Avenue. As we sat down, Lane turned to me and, rather defensively, accused me of viewing him as "an embassy boy," i.e., someone who carried propaganda water for the U.S. embassies. I was a bit nonplussed since I had never exactly put it that way, but it wasn't far from what I actually thought. I responded by trying to avoid any pejorative phrasing but stressing my concern that we shouldn't let the Reagan administration get away with misleading the American people and Newsweek's readers. As it turned out, however, I was on the losing side of that debate. Lane had the support of executive editor Parker, who favored an aggressive application of U.S. power abroad and didn't like his reporters undermining those efforts. Like some other young journalists of that era, Lane either shared that world view or knew what was needed to build his career. Lane did succeed in making a profitable career for himself. He scored high-profile gigs as the editor of the neocon New Republic (though his tenure was tarnished by the Stephen Glass fabrication scandal) and as a regular guest on Fox News. He's also found steady employment as an editorialist for The Washington Post.